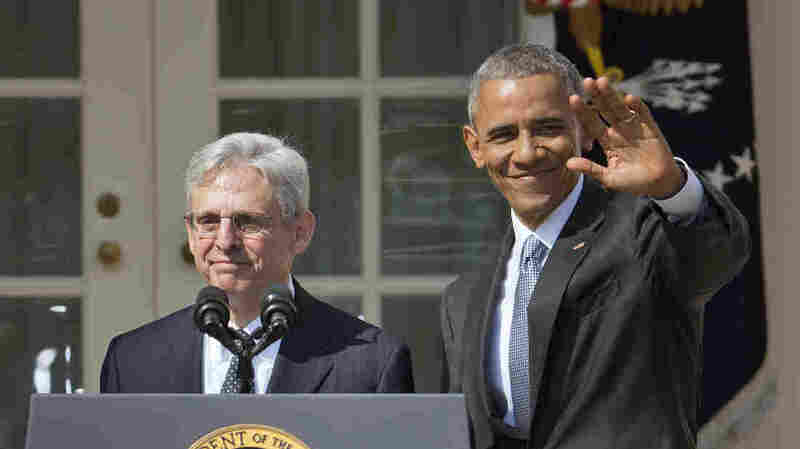 White House Makes Full-Court Press For Garland As Supreme Court Nominee President Obama is hoping his pick of D.C. appeals court Judge Merrick Garland can force Republicans to consider him — or face the political consequences. President Obama stands with U.S. Court of Appeals Judge Merrick Garland, as the president announces Garland's nomination as a justice of the Supreme Court. President Obama's nominee for the Supreme Court is already making telephone calls to senators, hoping to win a confirmation hearing. Merrick Garland will start making in-person visits to the Capitol on Thursday. That's the normal order of business for a high-court nominee. But with many Senate Republicans insisting they won't consider Garland's nomination, the White House is also taking its case to the American public. The PR campaign for Garland includes a dedicated Twitter handle (@scotusnom), a feel-good biographical video and a litany of details designed to humanize the well-regarded appellate judge. Not only did Garland graduate with honors from Harvard, the White House noted, he sold his comic book collection to help pay the tuition. "I'd like to take a minute to introduce Merrick to the American people," the president said in the Rose Garden. He highlighted Garland's record as a prosecutor who helped bring Oklahoma City bombers Timothy McVeigh and Terry Nichols to justice, and a jurist who's won praise from conservatives including John Roberts and Sen. Orrin Hatch, R-Utah. The full-court press began hours earlier with a mass email from Obama headlined, "I've made my decision." "In putting forward a nominee," the president wrote, "I'm doing my job. I hope that our [s]enators will do their jobs, and move quickly to consider my nominee. That is what the Constitution dictates, and that's what the American people expect and deserve from their leaders." Senate Republican Leader Mitch McConnell has a different view. He announced just hours after Justice Antonin Scalia died that the potentially tie-breaking seat on the Supreme Court should remain vacant until a new president is in office. "Give the people a voice in filling this vacancy," McConnell said again Wednesday on the Senate floor. The National Republican Senate Committee chimed in, calling Garland "an ideologue who would loyally stand with the court's liberal wing and bolster the radical Obama agenda." When Garland was named to the appeals court in 1997, 30 Republicans voted for his confirmation, including seven who still serve in the Senate. The White House PR campaign is designed to paint a picture of a nominee who's so reasonable and centrist that Senate Republicans look unreasonable for not giving him a hearing. "We will have to see if Republicans can sustain this posture," White House spokesman Eric Schultz said. "We continue to believe there will be ample number of Republicans who believe the Constitution comes before their party's political leadership." Sen. Susan Collins, R-Maine, told NPR's All Things Considered she believes the Senate should at least consider Garland's nomination. "The Constitution is very clear," Collins said. "The president has every right to make this nomination and then the Senate can either consent or withhold its consent. The only way that we can do that is by thoroughly vetting the nominee. And that means having personal meetings which I have scheduled to come up in about three weeks ... and, to hold a public hearing." The White House hopes to sway other Republican senators, especially those in swing states who are up for re-election in November.